Even though they can’t fly bed bugs can easily invade your home. They can get brought into your house attached to luggage, bags or clothing and can also be introduced through second hand furniture, such as beds, chairs and settee’s. Developing through many stages they grow to an oval shape of around 6mm. Their elongated eggs are cemented into cracks or crevices such as behind the wooden slats of your headboard or behind skirting boards and loose wall paper. Eggs will always be deposited close to the host and early emerging nymphs are very small and difficult to see. 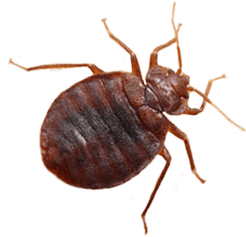 Biting on our exposed skin and feeding on our blood, bed bugs will be primary attracted to their host at night by the carbon dioxide that we breathe out whilst sleeping and also the warmth of the bedding. Bed bugs aren’t dangerous and don’t spread disease but some people do experience a reaction to their bites. However, having them in your bed can be a stressful and horrifying thought. Bites can cause itchy red bumps on the skin, usually on the arms, legs, hands and face, were the skin is exposed. Blood spots on the bedding sheets, tiny black spots on the mattress (feaces), mottled/cast skins as bed bugs shed their skin as they grow can all be signs of an infestation, as well as seeing a live example.